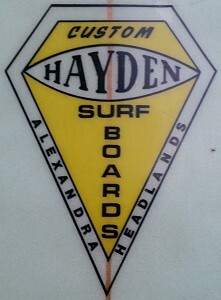 Hayden Kenny began surfing at Alexandra Headland on a hollow timber Gordon Woods' Okinuee. Second board, Balsawood/fibreglass board supplied by Gordon Woods. 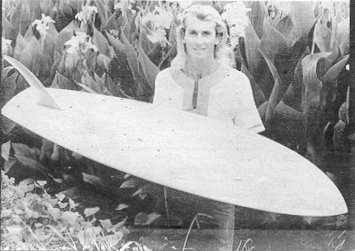 First board, shaped at grandfather's cow bales Maryborough, Queensland. Foam blank and materials supplied by Gordon Woods. Factory moved to Alexandra Headland, opposite the beach. Bob Cooper joins Algie Grud (dings) as staff. He brings a huge quantity of experience and talent after 10 years in the Californian surfboard industry, including Velzy Surfboards and Yater Surfboards. Multiple rectangles decal, possible precedent Windandsea Surfboards, California. Bob McTavish arrives from Wallace Surfboards, Brookvale. He is joined by Russell Hughes; later Darryl 'Rooster' Dell and Ken Adler. Ken Adler came eighth in the final of the 1965 World Contest in Peru, won by Felipe Pomar with Nat Young second. 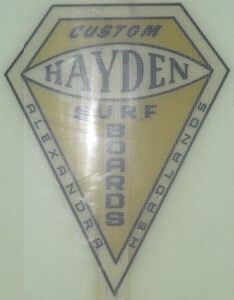 In 1967, Ken Adler would open San Juan Surfboards, Ballina, later Byron Bay, incorporating the orange sun motif initially used by Hayden surfboards and designed by Candy Calhoun (USA). 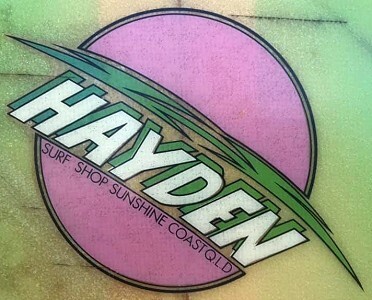 Hayden Sun Decal designed by Candy Calhoun (USA). SURF INTERNATIONAL Vol. 3 No3 1970 pp 40 to 43. Noosa Nostalgia 1963, with some notes about design and waves. 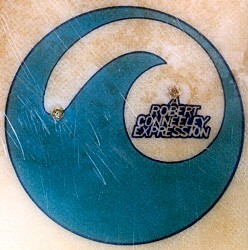 Robert Conneely sponsored to San Diego World Titles. 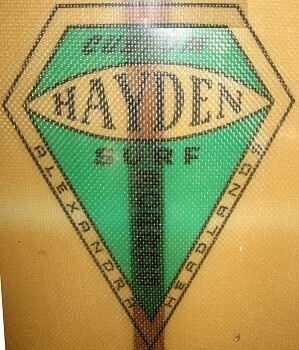 1967 Hayden Vee Bottom design, about 8 ft. Factory relocated to 164 Alexandra Parade after a fire. Hayden Kenny and Ken Adler (see San Juan Surfboards) shaping. Volume 10 Number 5, page 37. Factory relocated to Industrial Estate, Alexandra Headland. 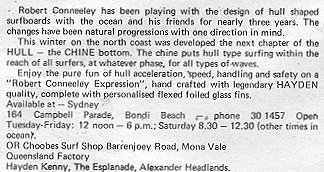 - similar to Barry Bennett Surfboards, Brookvale. of son, Grant Kenny, in competitive Life Saving events. The company is taken over by workers, Mick Hopper and Graham 'Cooky' John. 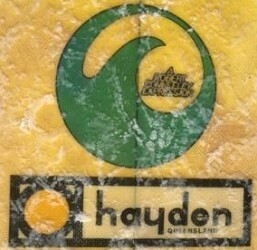 Logo Type : Small 'Hayden' Yellow dot. Comments : This board shaped by Bob McTavish is in incredilbe condition. Featuring a yellow nose (patch), black GT stripe with twin pin stripes (cigar band), and red body. Glassed by Bob Cooper. Kim surfed the Queensland titles in February (19)68, and the Aussies (Titles) in May of the same year. This board was then put away and never ridden again. The tail starts to show the "V" influence that an experimental McTavish used as part of his designs. -Australian Long Boarder, No 14. page 45???? 2. 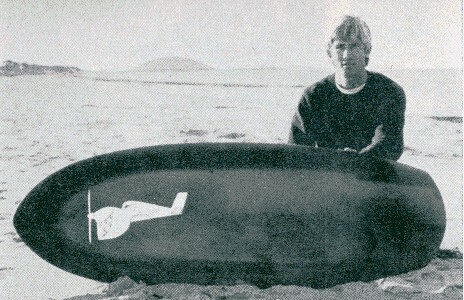 The board looks to have a leg rope block on the tail, which would indicate that the board has been ridden since 1976. 3. 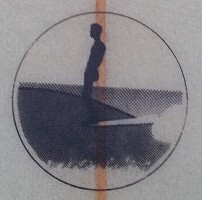 Rather than starting 'to show the "V" influence', the board is more likely to be at the end of this design. It would have been considered outdated at the 1968 Australian titles, see Midget Farrelly, 1968. 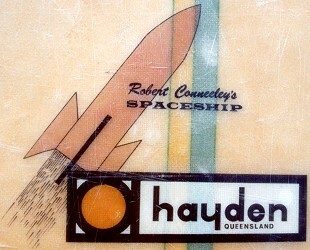 George Greenough and Spoon made at Hayden Surfboards. Popular Science magazine August 1969, page 92. Vol 2 No. 2 Page 105. Geoff Cater (2009-2019) : Catalogue : Manufacturer Index - Hayden.